A paper in this month’s edition of Health Affairs (gated) provides a stark reminder that many determinants of health lay well outside the boundaries of insurance and health care delivery. Hilary Seligman and her coauthors examined temporal trends in the incidence of hypoglycemia (dangerously low blood sugar, usually associated with diabetes), stratified by income*. They posit a plausible story about the “pay cycle” that develops in households, which is well established in the literature, particularly among low-income individuals . Toward the end of the month, a household’s resources—income, SNAP, Social Security, and/or other benefits—can become exhausted, ostensibly changing food consumption patterns. One in seven US households cannot reliably afford food. Food budgets are more frequently exhausted at the end of a month than at other points in time. We postulated that this monthly pattern influenced health outcomes, such as risk for hypoglycemia among people with diabetes. 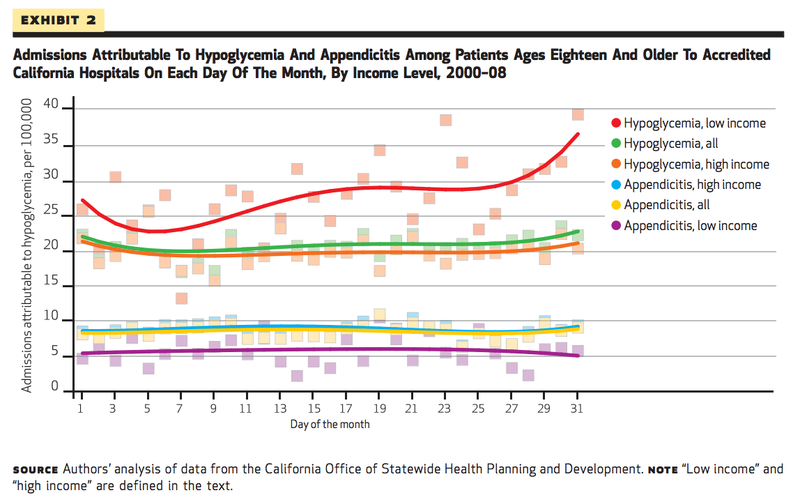 Using administrative data on inpatient admissions in California for 2000–08, we found that admissions for hypoglycemia were more common in the low-income than the high-income population (270 versus 200 admissions per 100,000). Risk for hypoglycemia admission increased 27 percent in the last week of the month compared to the first week in the low-income population, but we observed no similar temporal variation in the high-income population. These findings suggest that exhaustion of food budgets might be an important driver of health inequities. This chart drives the point home. Low-income individuals are at higher risk of hypoglycemia—and that risk changes over the course of a month, consistent with a hypothesis about exhausted food budgets. Their high-income counterparts exhibit no significant trend. 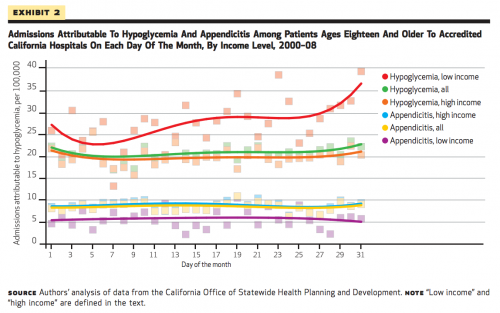 Appendicitis findings are offered as a “control”; we wouldn’t expect household budgets to wield any influence over that. It is reasonable to postulate that the exhaustion of food budgets late in the month might also influence admission patterns for other diet-sensitive diseases, such as congestive heart failure. One thing the study doesn’t unpack is insurance status (it’s not a covariate). But neither do the authors make any policy recommendations based on coverage. The temporal trend doesn’t seem to something that could be corrected by more visits to ambulatory care. Instead, it’s a mirror of social inequities that still plague our nation and drive health disparities. Policy wonks have a terrible habit of focusing on insurance and health system design (and here I count myself, because health care financing is the research I find most interesting, so it’s what I write about). This gives short shrift to the “social determinants” of health—upstream factors related to lifestyle, environment, and socioeconomic status—that cannot be corrected by medical interventions. We’re fond of highlighting how much more the United States spends on health services, but an idiosyncrasy that receives less attention is how much less we spend on other social services. For a fuller discussion of that than I can provide, you should see this interview with Lauren Anne Taylor and Elizabeth Bradley, authors of The American Health Care Paradox. These findings also illustrate the difficulty in finding policy solutions to address health disparities. The authors note that food pantries and soup kitchens already ramp up staffing and resources toward the end of the month. We could explore different ways to distribute existing benefits, but that may have other negative impacts (ie: making it harder to pay rent or bills at the beginning of the month). Of course, in the political arena, the discussion isn’t framed as “expanded coverage or expanded social policy”. Instead, we’re stuck with polemics about “expanded coverage… or not.” As complicated as insurance is, we default to it in health policy because it seems the most facile way to confront medical problems. That doesn’t make it the most effective way—but it’s hard to be optimistic about changing the terms of the debate. *Here, “low-income” is defined as residing within a ZIP code where average income is in the lowest decile of admitted patients in a given year. Everyone not matching this criterion is “high income”.